The traveling heirloom tomato event will visit several Golden State gardens in the months ahead. 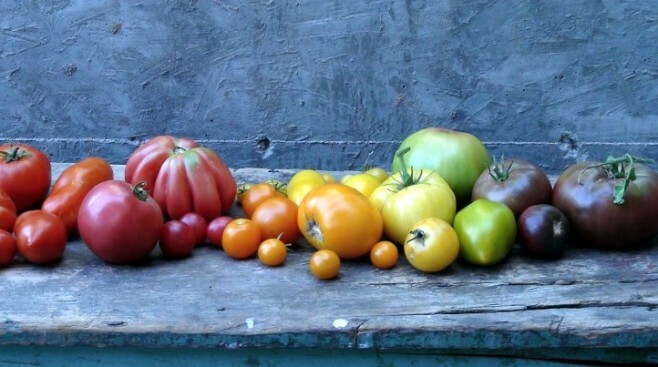 "The world's largest (and most fun) heirloom tomato seedling sale!" will visit a number of California towns in March and April 2018. ADDING A FEW HEFTY SLICES... of tomato to a real stacker of a sandwich? The kind of sandwich that may have more than two pieces of crusty, handmade bread, and more than a single style of spread, and probably a couple of slices of dill-flecked cheese? It's a summer must for sandwich mavens, flat-out, for the tomato slices add the juice, and the potent zing, and that bright garden flavor that doesn't come from dill-flecked cheese (as delicious as that might be). The long, short, and juicy truth of it? Tomatoes simply are summer, in spirit and texture, and they're pretty springlike, too, which makes the arrival of Tomatomania! each year so perfectly timed. This is "(t)he world's largest (and most fun) heirloom tomato seedling sale," and it is so big that it actually goes on the road to visit a number of Golden State spots. And when we say "spots" we do mean gardens and gardening centers, the kind of places that you will want to be in March and April, if you're prepping your yard for warmer days. CORONA DEL MAR... is first up on the itinerary, in early March, and Sonoma rounds it all out in the middle of April. You'll be able to stock up on just the sort of seedlings that'll produce orbs in all sorts of gorgeous hues, the sorts of orbs that slice well and stack on sandwiches in the middle of summer (and make beautiful caprese salads, and beautiful pasta sauces, and amazing pizza toppers, too). Are you upping the general vibe of your edible garden this year? Or growing tomatoes for the first time ever? Consider a swing-by of Tomatomania!, should it pull into a town near you, for tips, encouragement, and those sandwich-perfect seedlings, seedlings that will one day be huge, quality, oh-so-ripe tomatoes.